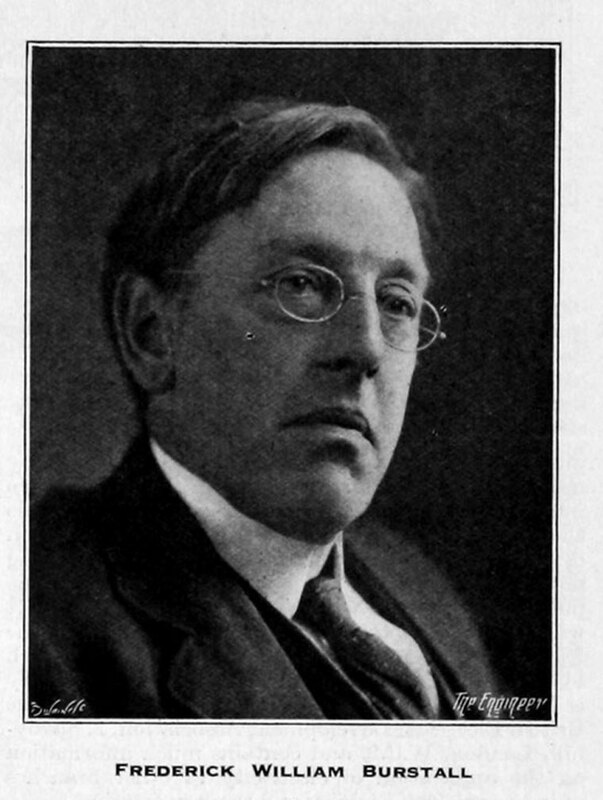 Professor Henry Frederic William Burstall (1865-1934) of the University of Birmingham. 1911 Living at Oakhill, 60 Upland Road, Selly Park Road, Selly Park: Frederic William Burstall (age 45 born Aberdeen), Professor Of Engineering Mechanical at Birmingham University. With his wife Lilian Maud Burstall (age 36 born Simla, India of British parents) and their children; Doris Lilian Burstall (age 12 born Birmingham); Margery Annie Burstall (age 12 born Birmingham); Aubrey Frederic Burstall (age 9 born Birmingham); and Francis Hereward Burstall (age 7 born Birmingham). Three servants. Professor FREDERICK WILLIAM BURSTALL will be remembered not only for his long connexion with the University of Birmingham, but for his classic researches on the gas engine, which exerted considerable influence on its economic construction and operation. He was a member of the Gas Engine Research Committee of the Institution from its inception in 1896, and prepared the Committee's reports which were published in 1898, 1901, and 1908. In addition he was the author of three original papers read before the Institution: "Indicating Gas Engines," in 1909; "The Energy-Diagram for Gas," in 1911; and "A New Form of Optical Indicator," in 1923. For the latter paper he was awarded the T. Bernard Hall prize in 1924. Professor Burstall was born in Aberdeen in 1865 and received his education privately. He served a four years' apprenticeship, terminating in 1885, with Messrs. J. Stewart and Sons, of Blackwall. After studying engineering for one year at University College, London, he entered St. John's College, Cambridge, and graduated as sixteenth wrangler in 1889. In 1890 he was placed in the first division of Class II in the Mathematical Tripos, Part II. He then entered the office of Sir Alexander Kennedy, M.I.Mech.E. (Past-President), and in the following year became demonstrator in the engineering department at King's College, London. His appointment to the chair of civil and mechanical engineering at Mason's College, Birmingham, dated from 1896. In 1899 he went to the United States to study educational methods in engineering. On the formation of the mechanical engineering department of the University of Birmingham, Professor Burstall was appointed head of the department and was responsible for its organization. During the War he was engaged on experimental work for the Government, which he carried out in the University laboratories; his researches included studies in air flow which he undertook for the Admiralty and Air Board, and the design of radiators for large tanks. Subsequently he was associated with the experimental extraction of benzol from coal at several South Derbyshire collieries. In 1925 he was appointed vice-principal of the University of Birmingham, and he held this position until 1930. On his retirement in that year the title of emeritus professor was conferred upon him, and he was nominated a life governor of the University. Professor Burstall had been a Member of the Institution since 1896, and was also a Member of the Institution of Civil Engineers. His death occurred at Alvechurch on 15th July 1934. Frederick William Buntall was born in 1865 and served his apprenticeship with J. Stewart and Sons, Blackwall, subsequently graduating at St. Johns College, Cambridge. After serving for a time as Demonstrator in the Engineering Department at King's College, he was appointed Professor of Civil and Mechanical Engineering at Mason's College, Birmingham, and on the establishment of the Mechanical Engineering Department at Birmingham University, Prof. Burstall was appointed as its Head. His work in this capacity was widely known, and in 1925 he was appointed Vice-Principal of the University, and in 1930, on his retirement, was made a Life Governor of the University. He died on 15th July, 1934, at the age of 69. He was elected a Member of the Institution in 1922. This page was last edited on 15 December 2018, at 10:52.